Compatible with your Smartphone, Tablet or PC. Wall or desk mounted thermostat. Suitable for heating or cooling applications. The system is wireless so it’s easy to install. Cookies are used on our site solely for the intention of completing your order. Product code(s): RT510RF. Sleep Mode. 5 Year Warranty. Can be used for volt free and 230V applications. NEW FEATURES. We will be more than happy to help. Receiver Size: W-130 H-95 D-65. Easy Installation. Drayton Digistat Room Stats are a breakthrough in programmable thermostats. Temperature Limit locks (High/Low). 12/24 Hour Clock Choice. Pre set clock. User adjustable Min/Max temperature setting. Model No: ST620WBC. Salus RT10-24V Electric Dial Electronic Underfloor Heating Thermostat. Salus RT10-230V Electric Dial Underfloor Heating Thermostat. Salus TC100 Wiring Centre for Central Heating and Hot Water Systems. Model No: RT510RF. Can be used for volt free and 230V applications. 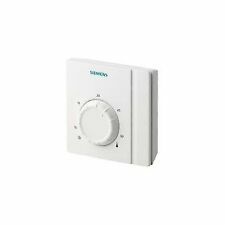 Salus ST620WBC Wireless Programmable Room Thermostat for Worcester Combi Boilers. Salus ERT20RF Electronic Manual Radio Frequency Wireless Dial Thermostat. LIFETIME GUARANTEE! WI FI TOUCH SCREEN! BEST PRICES! Heatmiser Neostat 12v. These were fitted for approximately 1 week (but not used) until it was realised they were incorrect as the system required hard wire network and not wireless network which these are. All in perfect working order, they don’t come with the original box or instructions, these are easily available online. Dispatched with Royal Mail 1st Class. 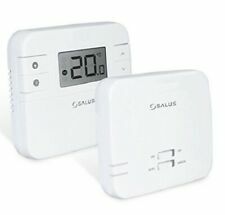 Salus RT500RF Digital Wireless Programmable Room Thermostat 868MHz. The Wireless RF version has all the features of the RT500 with the added ease of no wires. • Factory set pre-bound. • Large blue backlit digital display. The RT310i is also suitable for use with both IOS and Android devices. The RT310i features C/W RT310i GATEWAY. Wall or Surface mount thermostat. Option between 'schedule' or 'manual' mode. Product code(s): IT500. Wall or surface mount thermostat. Compatible with new boiler plus regulations. Compatible with the New Boiler Plus regulations. We will be more than happy to help. Trading since 1999. 1pc Wifi thermostat. 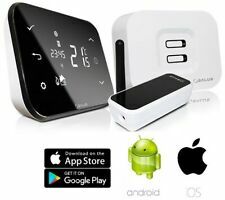 -This is a Wi-Fi enabled room heating thermostat allows you to access it via iOS or Android devices with a free application. Self power consumption: <0.3W. -Large LCD display with backlight. In the box - 3rd-generation NEST Learning Thermostat with stainless-steel ring, Heat Link, trim plate, screws and Instalation Guide. It turns itself down when you’re away. That’s how it saves energy. The RT310i is also suitable for use with both IOS and Android devices. C/W RT310i GATEWAY. Wall or Surface mount thermostat. Volt Free Output. Option between 'schedule' or 'manual' mode. No need to change the wall mounting box. Accommodates up to three secure off-peak heating periods every 24 hours. Hive 2 active heating thermostat. WiFi control. Up for auction is a Hive active heating 2 thermostat. The Hive is brand new and unused/unregistered but the box may show some signs of damage or there may be some little flakes of muck under the protective pull off cover. There is no damage to the thermostat itself and as stated it is brand new (not refurbished) I have a few of these thermostats one will be sent out at random. It will come complete with batteries and user guide. The auction is purely for a hive thermostat only. No other hive components (hub, reciever etc or installation). Any questions please feel free to ask. Note; This product is designed for use with a SYSTEM or HEAT ONLY boiler, NOT a COMBI Boiler. We take out reputation seriously. SECURITY MARKINGS. Digital RF Room Thermostat Programmable. TEAM SUPPLIES SPECIAL. Made of high quality material, the thermostat is durable and safe to use. It is easy to install and convenient to use. Besides, it has large LCD display, complete functions and easy operation. 8, With antifreeze function. The help of the Wireless Thermostat,you can Increase your comfort and decrease your energy bill,so it is the first choice for your room heating system. This is a Wi-Fi enabled room heating thermostat allows you to access it via iOS or. Further enhanced by an inbuilt backlight this thermostat is also ideal for those with poorer eyesight or where the location is dimly lit. • Output On Indication. • °C or °F Selectable Display. • Cooling Option with Compressor delay. RFWRT Digital RF Room Thermostat (programmable). Honeywell St9100c Timer Heating Control. Dispatched with Royal Mail 1st Class. Unused, have a small number left over from a job. 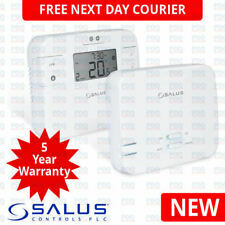 5 YEARS WARRANTY FROM SALUS. FOR COMPATIBILITY SEE LINK BELOW:-. For Boilers (Central Heating). Digital Room Thermostat Volt Free. Needs 2 x AA batteries (not included). It will automatically turn on/off heating device as the ambient temperature changes, in order to maintain a constant room temperature. Heating Thermostats. Heating Thermostats (16). Hot Water Efficiency (76). Large LCD touchscreen with backlight display and double temperature display mode. Current Load: 3A. 1 Thermostat. Range of Temperature Display: 0°C~40°C. Temperature Setting Range: 5°C~35°C. Screen Size: 60 47mm.